scans_daily | Batman #23 - "The Brave and the Mold"
Not sure how I feel about this. I feel like... if you kill someone in front of Batman, you don't get to just walk away (so to speak). But then again, Swamp Thing gonna Swamp Thing. And Bats knows that. What is he going to do, lock him up? This puts them in an unresolvable conflict, given the nature of the narrative. Puts a bad taste in my mouth when an author does that in this sort of shared space. Well, you explained it yourself, the point of any interesting narrative is to see concepts like this collide, just because its not resolved in a way that would favour Batman doesn't mean it's unresolved. 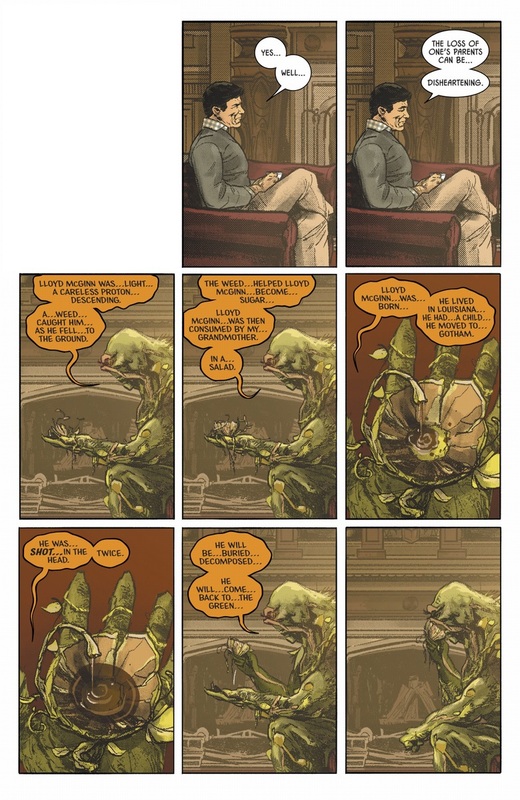 Interactions like this will likely colour his interactions with Swamp Thing in the future. 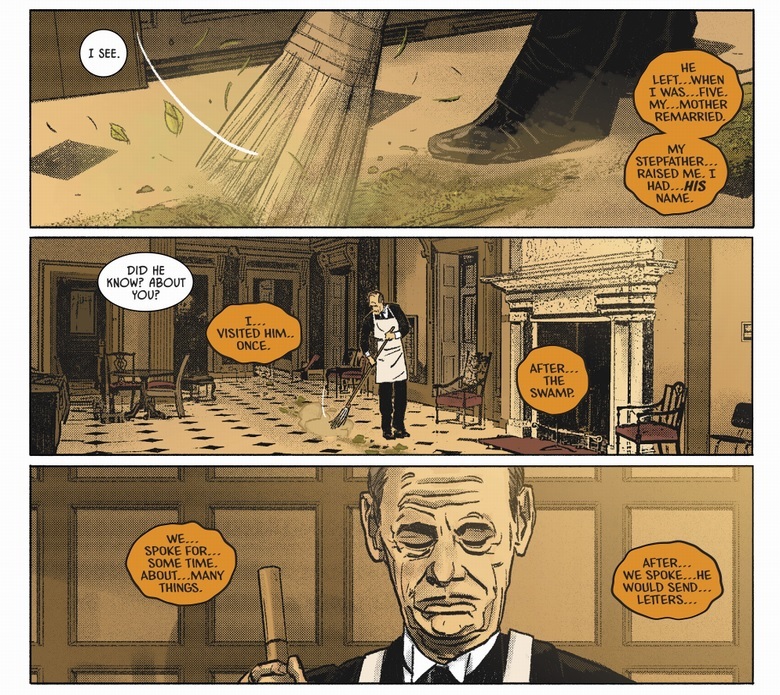 Some things in the DC Universe are just above the law, and Batman is only human. I'm sure his relationship with the Spectre is similar. I think my problem is that given DC's current track record, I don't think there will be any follow up or repercussions to this. 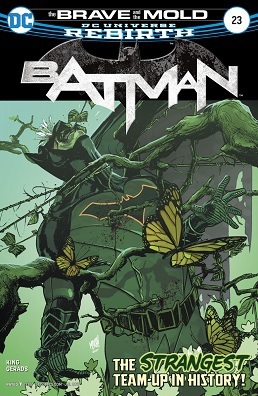 If this puts Swamp Thing at odds with DC's heroes as Batman puts word out, that would be one thing. But it's not... next time he pops up in a Superman book Clark will be like "Yo Swampie, sup?" This should put Swamp Thing against most of the heroes in the DC universe, should make a lot of the boy scout types wary of him at best, hostile at worst. I don't have faith they'll follow through with that. Basically I don't like this because it sets up an interesting premise that 1.) Will never be resolved 2.) And will either color Swamp Thing's appearance in the future or be outright ignored. Swamp Thing's put out enough. He's a thing in the swamp, after all. 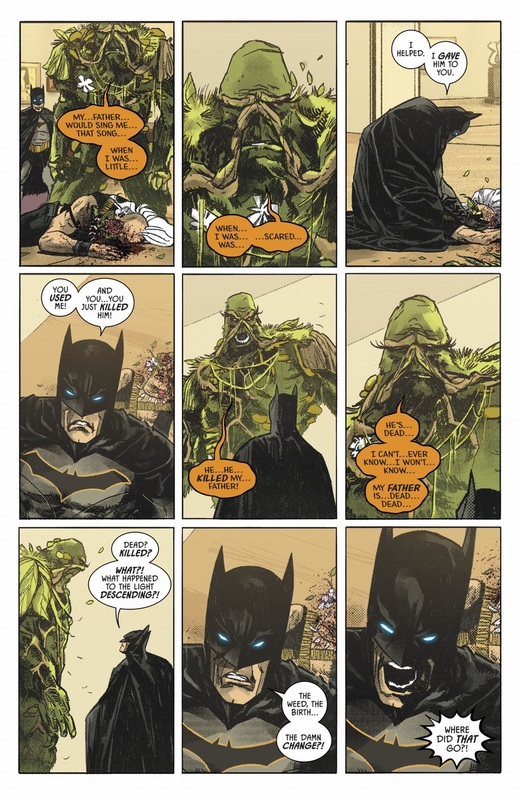 I kinda feel it fits, Swamp Thing *can* just leave an unresolved conflict, in a way that few others can. And if they meet again, Batman can be mad, but they so rarely meet, and it may be of something of enough importance he can't do anything about it- probably even. I like it that this doesn't resolve at the end - not everything has to - kind of like real life. What I really liked about was that Alec (at least IMHO) really believed everything about the change and falling back into life......till the killer was standing right there. Then it's straight up "YOU KILLED MY DAD!" I liked it too! Totally came out of left field. 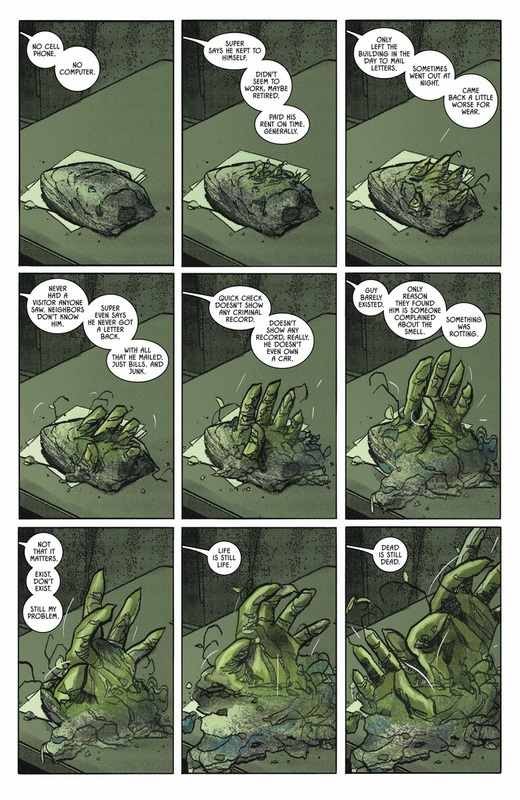 Okay, I kinda want Tom King to write a Swamp Thing book now. Ditto! We had a good run with Snyder and an excellent run with Soule, so time to bring Swampy back and hand him to King! Even if for a mini-series and with this artist? Oh god would it be great! 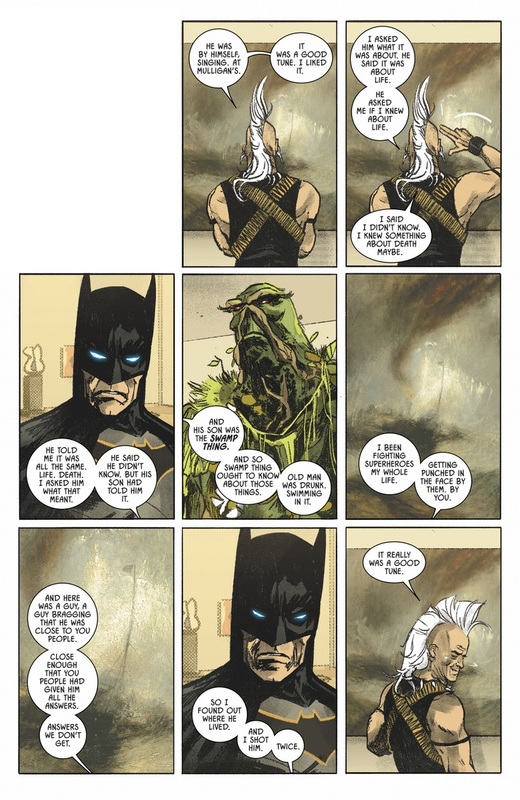 While I do love what Tom King did with a one-off meeting of the Dark Knight Detective and my favorite muck-encrusted mockery of a man in a classic unstoppable force/immovable object scenario at the end, I do have a bit of a tiddle with this issue: The chapter captions. They weren't necessary to the story, I feel. Next up: The Brave and the Cold, a heartfelt duel with Mr Freeze! Then The Brave and the Foretold, when Batman must prepare for the return of Solomon Grundy next Monday! Then The Brave and the lol'd, when Batman faces his most infuriating nemesis, Harley Quinn! Then Lois Lane leaves Superman for Batman in "The Brave and the Cuckold", the alt rights favorite story of the year. He's the exact opposite. He's the anti-cuck, or counter-cuck, the inverse of cuck. His liberal streak is organic, if his parents hadn't been killed and, you know, the whole Batman thing, he'd likely be a Clintonian. Also he can get much better than Lois. Lois is a Basic. "My father would sing me that song, when I was little...when I...I was...scared..."
Saddest moment, for me. You can practically hear the sob in those ellipses. I ignored the ellipses after about the 12th. Hey, I try not to let small dots overwhelm me. Anymore. Are the ellipses a regular Swamp Thing, uh, thing? The only Swampy books I've ever read were the New 52 ones and the Len Wein mini that came out last year. The ellipses were there in the mini but not present in the New 52. 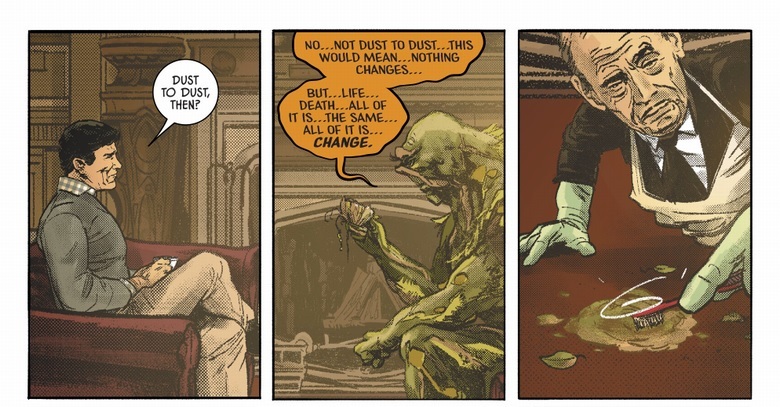 I don't think they're a regular thing - Swamp Thing didn't talk too much like that during the New 52, but it doesn't feel that grating in either case. 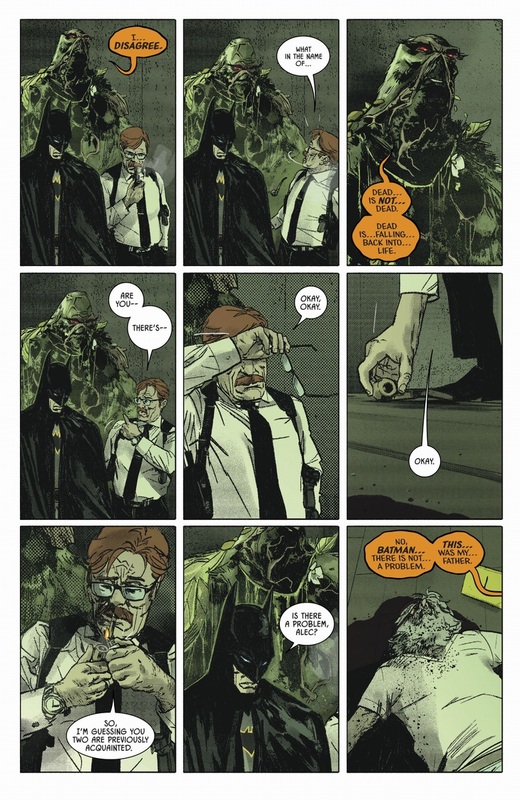 Commissioner Gordon: "yeah. I'm working with Batman. 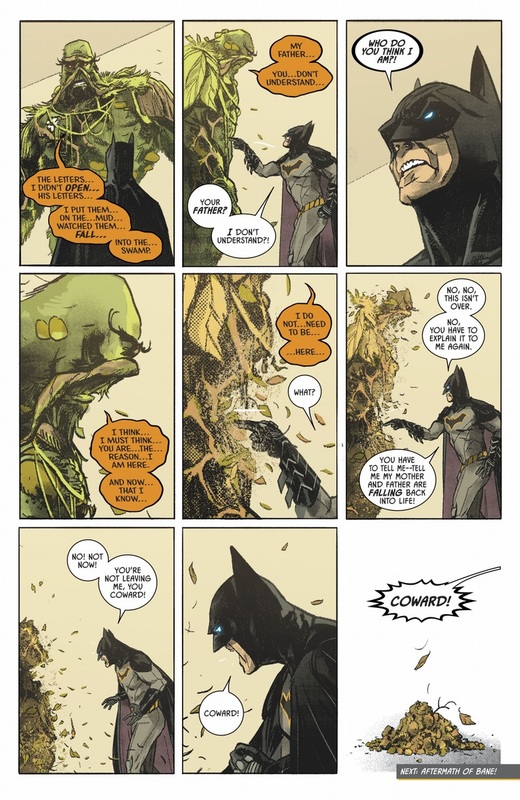 A swamp monster appearing out of nowhere is normal when you're working with Batman." That's weird. Batman is obviously modeled after Michael Keaton but Bruce Wayne looks like, I don't know, Roger Moore?